Blog posts related to commercial buildings. This includes, hardware, security installations, construction jobs, master key systems, access control and more. Regularly we get called out to new construction projects or remodels towards the end of construction as the user is taking over their new space. This is a time of transition where the small things on a job are often overlooked and become noticed. One of these is the lock hardware and user needs of keys. This blog post covers common mistakes that are overlooked by both contractors and users when remolding or adding buildings. We recommend working with us in advance to save you money by doing it right the first time. Here are some mistakes, examples and ways to avoid them. Incompatible key ways are the most common mistake we see. For example, an existing building uses Russwin cylinders and the keys and the contractor installs Sargent cylinders. In order to get the building back to one keyway the customer has to purchase Russwin cylinders . The client ends up purchasing locks twice. Have the contractor or locksmith spec the new cylinders to match the existing cylinder type and manufacture. Another common mistake we see is installing different manufactures hardware. This can cause incompatible keyways, additional hardware to have on hand for maintenance and additional keys. For example, there was an apartment complex that used Best Interchangeable Cores (IC) for their residents. 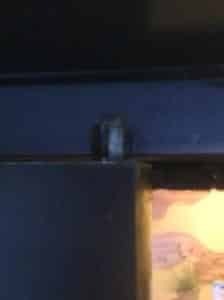 Then they added a club house where the contractor installed Schlage hardware, so not only was the keyway incompatible but the Schlage hardware would not accept a Best IC. In order to get the user back to one key system the hardware had to be replaced to accept Best IC. Have the contractor or locksmith spec the hardware to match the existing hardware type and manufacture and/or at least be compatible with the existing system. A smaller issue we see is that when new locks are installed the most common function – entry (53) for an office or front door is used. But storage doors that should always be locked and only opened with a key, then need to be replaced. Discuss the function and use type for each door. The five most common functions are entry (53), storage (80), classroom (70), passage (10) and privacy (40). This issue is mostly found among multiple building complexes. The contractor normally orders a master key key system from the factory with the hardware, per building as each building gets built. But the problem you can have for example, is at a six building apartment complex the end user has six master keys (s)he has to carry that are not compatible. When if done correctly the user should have one master key because they are managing the whole complex. Consult with locksmith and user groups to customize master key system to their specific needs. These are some of the common mistakes that we find when we are called in to setup a masterkey system for the final users as they take posession and they are not happy to have to pay for items twice. The simple solution is to consult with us, your locksmith, at the beginning, during and for the final transition of occupying the space. Ideally, we can order the right hardware and cylinders to match your existing system. Then only pin the cylinders to the master key or user needs – once. Doing the full job right the first time. Let us know if we can save you money doing it correct the first time by calling 541.632.3968. We regularly receive residential and commercial requests about access control options for doors. There are many options to choose from and we can make what you want happen. The locks range from $150 – $2,000+ per unit depending on the features you want. 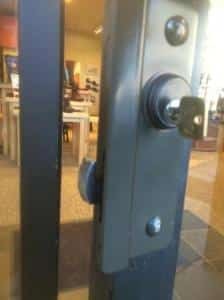 Here is a short buying guide to help you choose the best lock for your needs and some basic recommendations we commonly make. For residential homes we recommend Schlages Keypads, Touch Screens or Connected Devices. For commercial applications we recommend Kaba Ilco’s Simplex Series or Eplex Series. We can supply any of the locks and install them. Call us at 541.632.3968 if you have any questions or would like to discuss options. We frequently receive requests to both copy “do not duplicate” key and/or to provide them for clients. This can be a controversial item so here is a short post on how we address it. 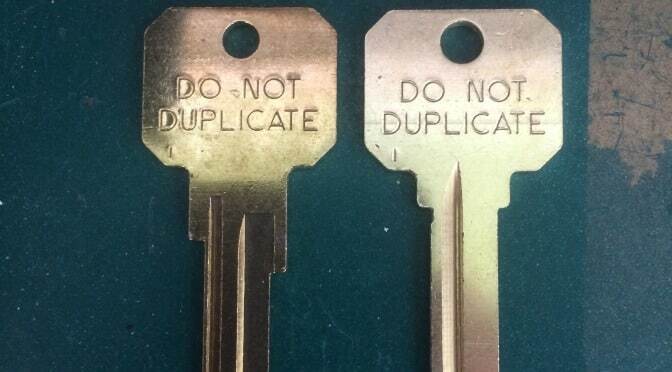 “Do Not Duplicate” or any similar wording, stamped on a key is a false sense of security. There are no laws stopping anyone from not copying it. Although, it does provide some psychological resistant as many hardware stores and some locksmith will not copy a Do Not Duplicate Key. Our policy is to explain this to the customers asking, and let them decide. 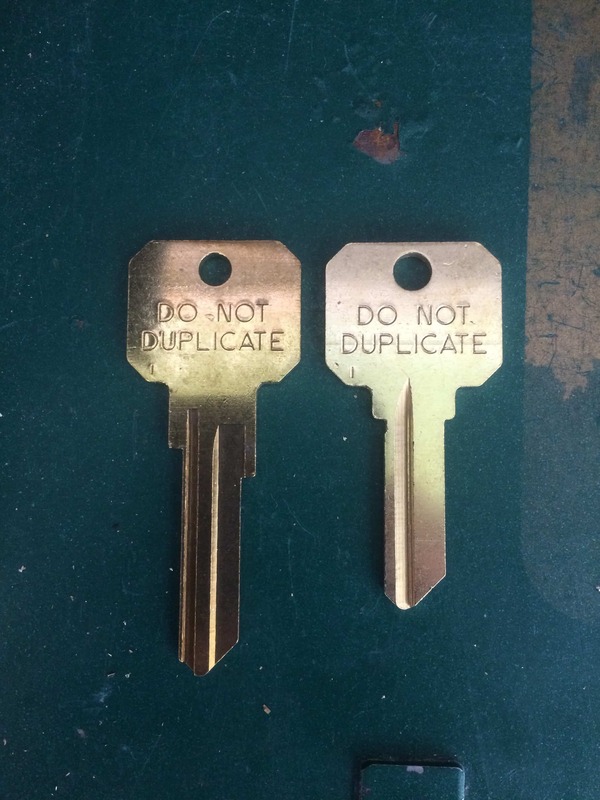 We do copy “Do Not Duplicate” stamped Keys. If you would like true key control, that is where no one can get a copy of it made, that exists and can be provided for your security. Do Not Duplicate Keys: Orders for keys stamped “Do Not Duplicate” or similar wording will be handled in the same manner as any unrestricted keys . Team members should inform the consumer that the use of keys stamped “Do Not Duplicate”, or similar wording, is not effective security, and further that the use of such words is deceptive because it provides a false sense of security. Consumers who desire effective security should purchase a patented key control system rather than rely on a “Do Not Duplicate” marking. This does not apply to keys protected by law. 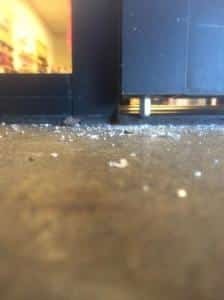 Over the last couple of months there have been a series of aluminum store front break-ins at night. 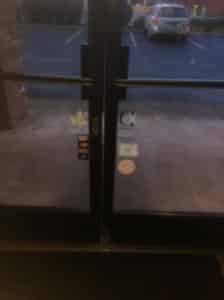 The person(s) has been using a crowbar to bend, break and move back the single point of latching to clear the frame on single and double aluminum store front doors on multiple businesses in Eugene. From our perspective as locksmiths it may be the same person, or it is at least a similar style of break in entry. But we will leave this to the police. to decide. 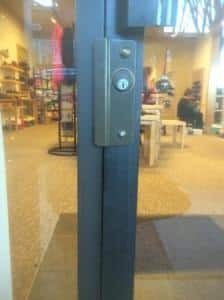 In this post, we are going to cover the standard aluminum store front door sets, the common points of securities, followed by different ways to increase your doors security and the package prices to do so. An aluminum store front door has an aluminum outside frame with glass covering the majority of the inside panel. This is designed for retail spaces, for window shopping and a transparent welcoming attraction. This differs from a traditional solid core wood or metal door and the type of hardware and security needed. The standard aluminum store front sets are (a) single doors and (b) double or a pair of doors. See pictures below. They can be built with 1 to 5 points of mechanical locking (not including mag locks or other electronic security). A point of locking is where the active door engages with the door frame. Single doors typically are installed with one point of locking while a pair of doors have two points of locking. There are two basic ways to add mechanical security to aluminum store front doors. The first is by protecting the point(s) of locking with bolt guard and the second is by adding additional points of locking. A bolt guard protects the exposed latch on an outward swinging door. 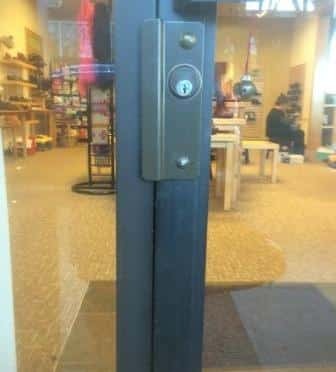 It protects the latch in two ways, one is from a direct attack such as cutting the latch and the other is by spreading the distance of pressure available by the latch up and down on the door away from the latch from a prying attack. 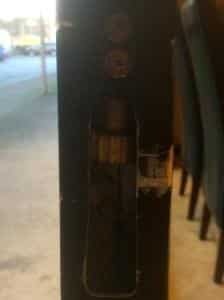 Here are two pictures of the bolt guard: one with the door closed and one where you see where the bolt is activated. Total: three points of locking. Total: five points of locking. Here are pictures of the opposing top vertical rod activation and locking point; and the surface mounted bottom bolt. 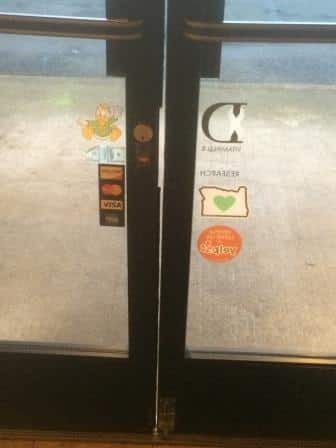 If you are interested in increasing your aluminum store front door security here are the following prices and packages for businesses in the Eugene area. Note these price quotes are valid as of 1/3/15, prices may change. If you are interested in having us install an increase the security of aluminum store front doors call us at 541.632.3968. Recently there has been some confusion about surveys, quotes and taking care of customs needs. I figured it would be appropriate to publicize and lay out our guide lines for providing quotes and surveys. We hope that this will make it clear for both our customers, and ourselves in building better relationships. The main topic of the post is for clarifying when quotes or surveys are free and when they are not. Here is a short list and I will go in depth lower. We quote jobs over the phone everyday. We ask a lot of questions to best understand your situation so we can quote you accurately. Work with us over the phone and it helps us better serve you. We have customers email or chat us for quotes weekly. Again we ask a lot of questions to better understand what you need to help. Note, that emails are checked once or twice a day. If you need a quote sooner call 541.632.3968. In Oregon any job that is over $1,500 is technically required to have a specification sheet laying out the details of the job, hardware etc. Albeit many jobs do not provide a specification sheet therefore we have no problem assisting you over the phone or internet to help you build one. A specification sheet is helpful because if you are getting multiple quotes it allows everyone to compare apples to apples, not apples to oranges and bid appropriately. It also minimizes our time to help you figure out what you need, which we charge for in the field. We do accept non numerical quotes from other competing companies covering the items and hardware to quote the same items. If you want us to come to your site, survey what you have and help you figure out what you need we can do that. But we charge for our time to do that. We not only have out trip time, our labor time and research time but more importantly our opportunity time cost of assisting other customers who want us to take care of them. Note, we do not bill upfront if we are finalizing a phone or email quote, or are continuing to do the job you have called us for. The service call and labor is included in the jobs we provide. If you are uncertain of whether a quote is free or if there will be a charge please ask over the phone. If you call and ask us to come over to help you figure out what you need and take care of your needs, we will do just that and charge for it. We hope this posts helps clarify when and where quotes and surveys are free and when you will be charged. 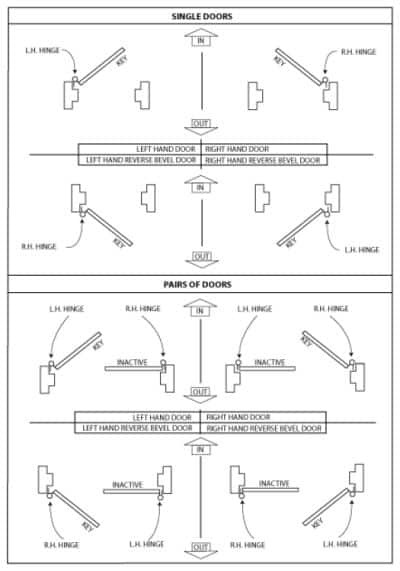 Have you needed to identify the handing of a door before? This is common when ordering or looking at hardware that is not multi handed or field changable. Below we will walk you through the different handing options and how to identify which handing you need. 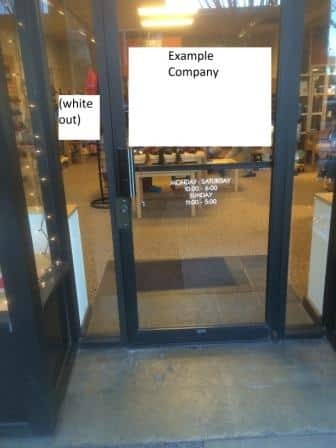 (a)Stand in front of the door, building or room as you are going to enter, or go inside the space. This should also be the keyed side, where you can put in a key. (b) Stand where you can put in the key. (a) Look at the location of the hinges. Are they are on your left side or right side? (b)If the hinges are on your left side, it is a left handed door. (c)If the hinges are on your right side, it is a right handed door. Following #1: make sure you are entering not exiting. (a) If you push in the door as you enter, it is a standard swinging door. (b) If you have to pull the door towards you to enter, it is a reverse swinging door. If you need additional assistance in identifying the handing of your door, just call us at 541.632.3968.